Jordan Heathcock, of Slop Shop, humbly says a lot of “trial and error” was involved in this Shovel Long bike build. It sure looks dialed to my eyes. 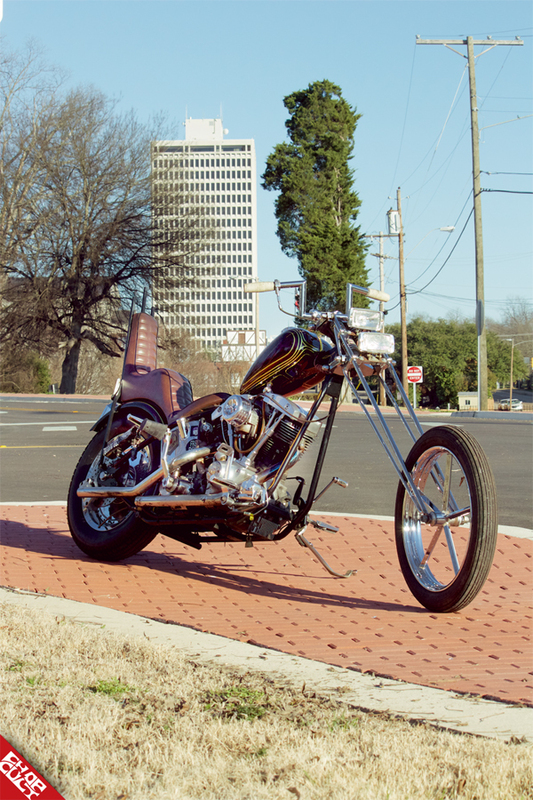 Jordan was part of the 2015 Greasy Dozen Builder Collective and produced this fine steed in the process. Like many dudes that are into choppers these days, Jordan has a little crossover in him. He started racing BMX at four years old eventually graduating to motocross racing at the tender age of nine. When I interviewed him on the phone for this little feature, I was sort of blown away when he told me he was only 23. Bikes of this caliber usually come from guys with a lot more time in. As we talked, I could tell he was an old soul. 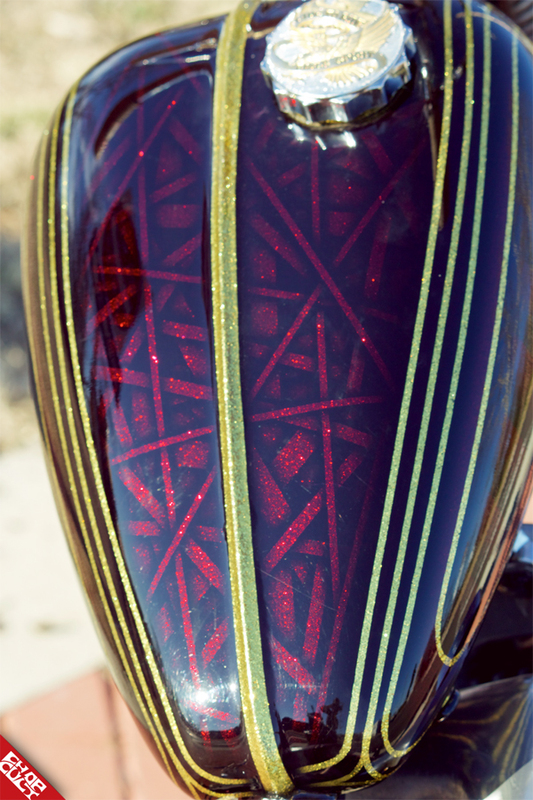 I was not surprised when he said that two years ago he had gone all-in trying to make a living in motorcycles. 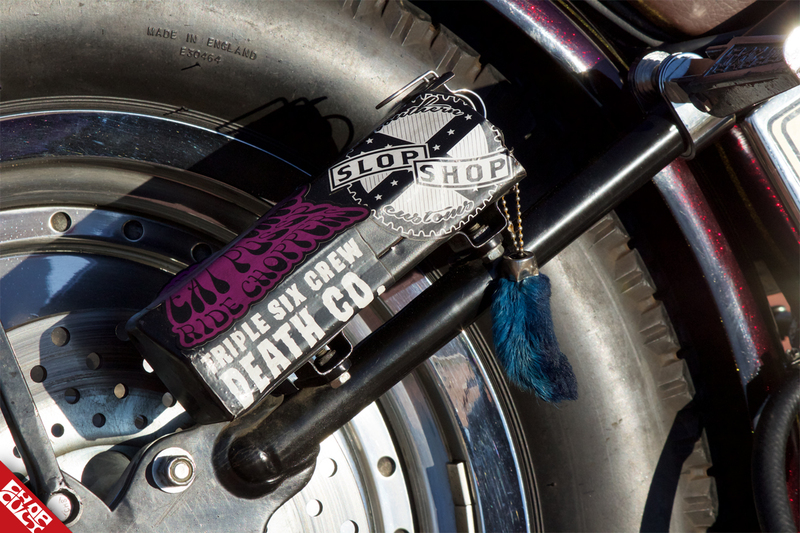 With the launch of Slop Shop, Jordan set himself on a path that many only dream of. That work got him to where he could finally open the shop. It takes a certain kind of dedication at 23 to spend your money buying shop equipment and paying commercial rent. Jordan knew it would take that, and more, to be taken seriously and make a go of it full time. It was the progression from BMX, to motocross, and then the surge in interest in vintage bikes and choppers that got him to this jump-off point. I was impressed with the humility and gratefulness he has towards making a living doing what he loves. That was a repeated theme throughout our call. 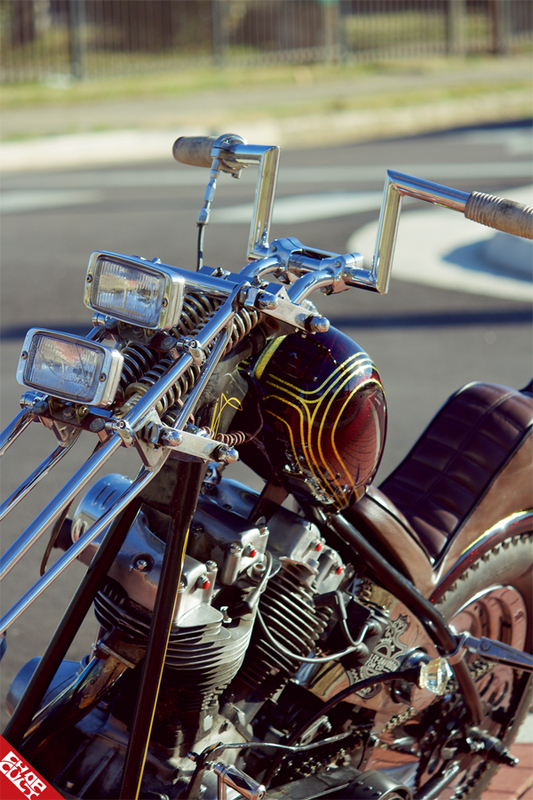 We spoke about his first build being an XS650 and laughed at how cliché that has become. I liked that he remains into the vintage dirt bikes that came before his current chopper-centric focus. The bike you see here is something that has been in his mind’s eye for a decade now. Growing up with bikes, he had always wanted to build a traditional long bike. He’s amazed at how this one “just sort of came together.” Sure, there was trial and error, but when you have been dreaming about a certain style of bike since you were a kid, “the build just had a mind of its own”. 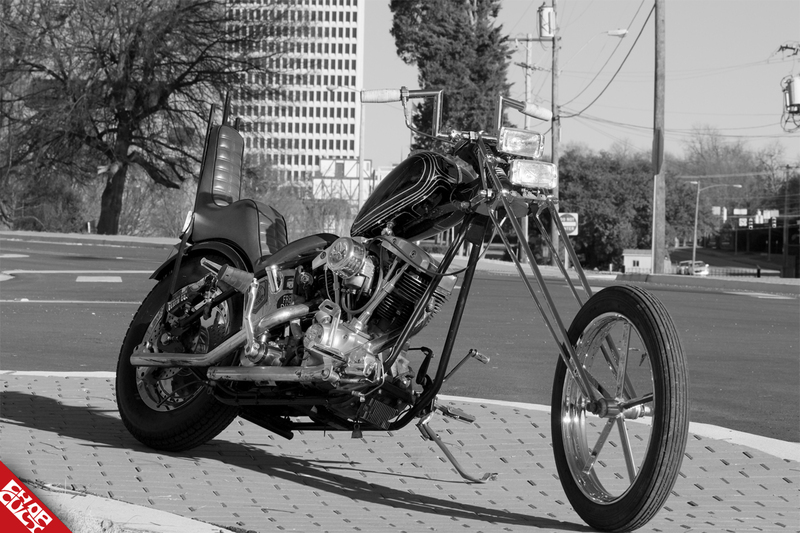 A desire to pay homage to the heyday of chopperdom meant that Jordan included as many swap meet parts as he could. Being selected as a Greasy Dozen builder gave him just a little extra drive on this mission. Starting a shop young is like a shakedown run. You never know what is going to pop up, but Jordan is rolling with the punches and putting himself out there. He candidly says he’s just going to keep finding a way to do what it what it takes to keep playing with motorcycles all day! 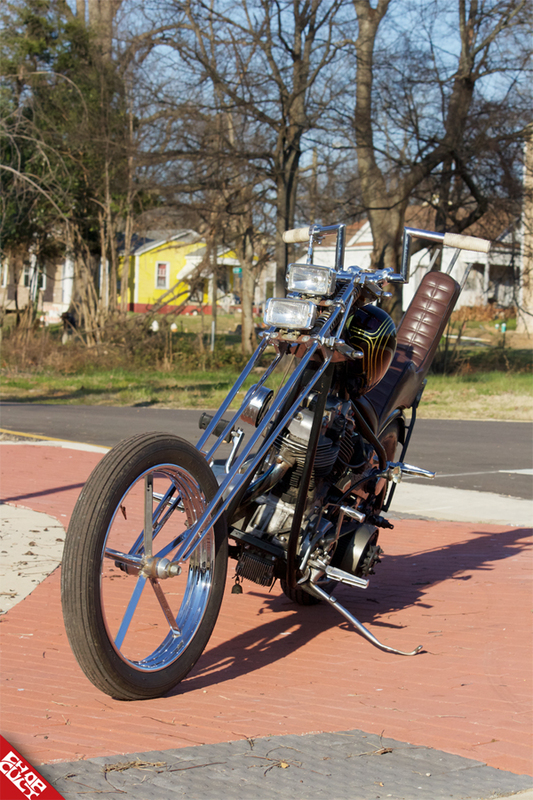 It’s a great bike, and one of my personal favorites from the 2015 Greasy Dozen Builder Collective. This year’s selection is running through May 21st and you can get the full details right here on Chop Cult. 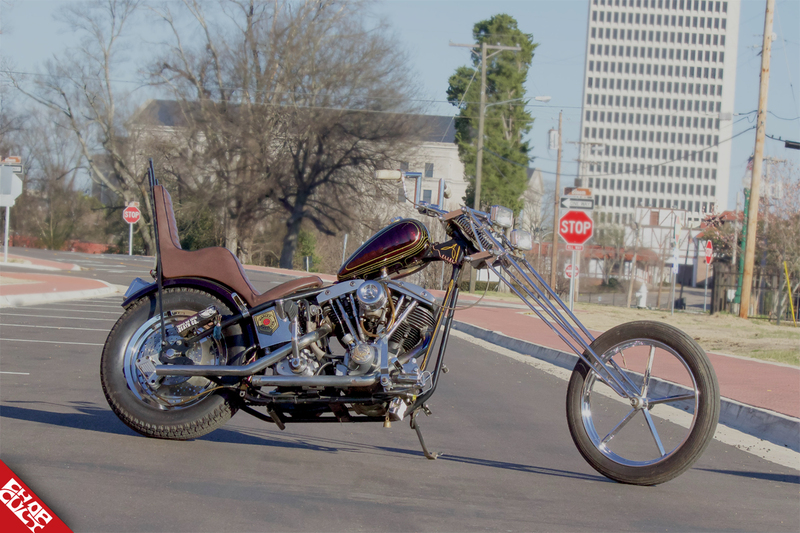 Glad to see these young brothers cranking out some stellar works.I love the traditional long chop look of this bike,a bike thatgoes back to the original values and creativity of the old chop scene.Outstanding job,Jason,keep carrying the torch. That drum brake story is good one!!! hell yea. solid dude. I heard he's pretty good at partying too. Great Bike, fantastic work, good to see young guys getting down with this.